While trying to come up with a name for this post, I kept getting the phrase “try to curry favor” stuck in my head. I don’t know where this came from since I’m pretty sure I’ve never used that expression. But,after checking to make sure it meant what I thought it meant, I does sort of work for this post. One of the handsome husband’s favorite foods is curry. Of course he likes it about 29389 times spicier than I do, but nonetheless, its still a favorite. So he was excited to see it on the 30 before 30 list. I guess you could say I was currying some favor when adding it to the list. See what I did there?!! Food pun…fantastic. 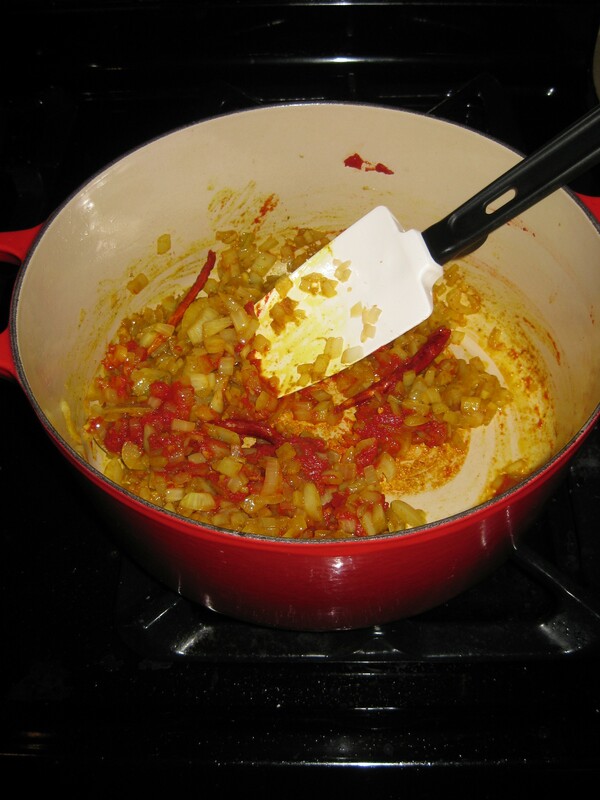 Last week I started digging around for a recipe for chicken curry. Seems easy, right? Not really. Most of the recipes seemed either overly simple or were big enough to serve 10 people. So I sort of combined two recipes. 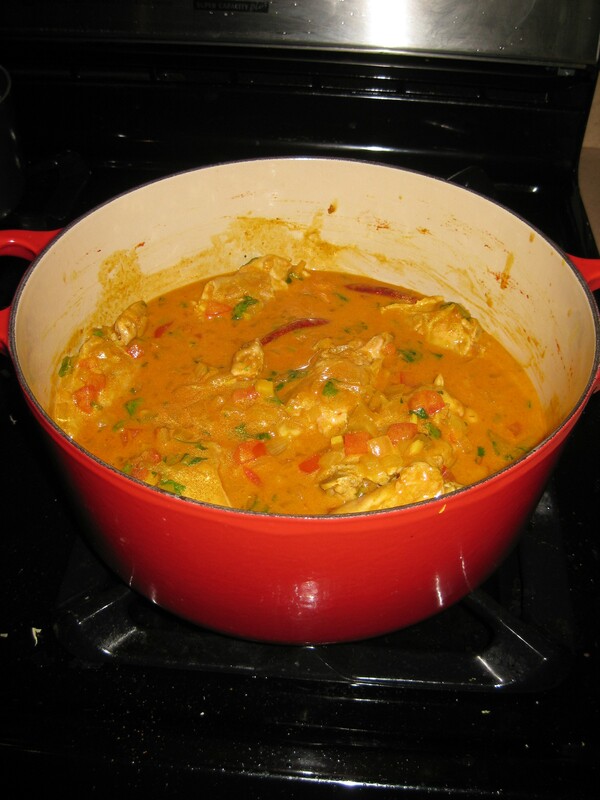 This one from thefoodnetwork.com and the recipe for chicken curry from The Joy of Cooking. Instead of giving you a step by step of the recipe, I’ll do a quick summary of each part. First, sear the chicken for a couple minutes on each side then remove from the pot and keep warm. Then you’re going to melt…you guessed it, butter. This household needs to buy stock in butter…honestly. Into the melted butter goes chopped ginger, onions, garlic and dried red chilies. After it was all really soft I added the tomato paste, and curry powder. And now a brief clarification: curry powder is sort of a myth. 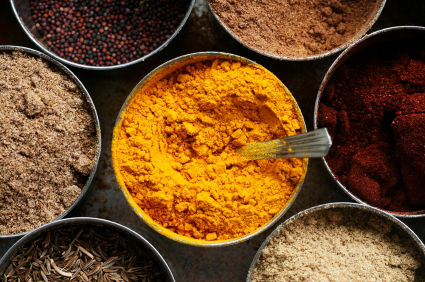 Curry powder is actually a mixture of a bunch of other spices you probably already know about: cumin, coriander, turmeric, red pepper and something called “fenugreek”, which is an amber colored seed with a strong smell. So it’s basically like buying “Italian Seasoning”….just more exotic and with its own fancy name. So now into the pot goes chicken broth and a can of coconut milk. Mmm….coconut milk. Bring to a simmer and add chopped tomatoes, cilantro, lemon juice and some lime zest. I actually added some chopped carrots and green pepper as well. Now pop the chicken back in and let it simmer until its thickened and the chicken is fully cooked. We added a little salt and some crushed red pepper, since it didn’t have enough kick for the handsome husband. Not terribly surprising since it wasn’t making me sweat/clearing my sinuses out. All in all, it was pretty good. But, it wasn’t as good as the curry I’ve had at restaurants. And, the chicken was a little bland. Joy of Cooking suggested using thighs, but I didn’t feel like they had much flavor. The sauce was really rich, but it didn’t get as thick as I would have liked. Oh- and it stained my favorite spatula a scary yellow color. (see pic above) Grrrr. Curry dinner for two...and plenty for leftovers! So, all in all…not the ringing success that some of the other recipes have been. 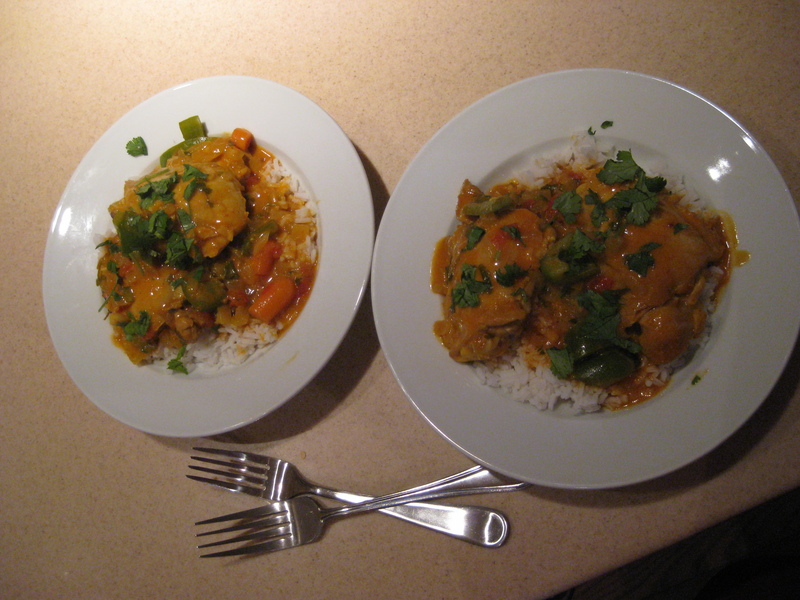 But, I was still currying favor with the handsome husband with leftovers the next day. No? Too much? UNFORESEEN BONUS: I discovered that you can buy low fat coconut milk. I’m sure purists would wince at that, but c’mon, I have suit pants that need to fit! And coconut milk is delicious in this sauce and I’m hoping to use it as a summer marinade. And by marinade I mean in pina coladas. More to come soon…including a list update!